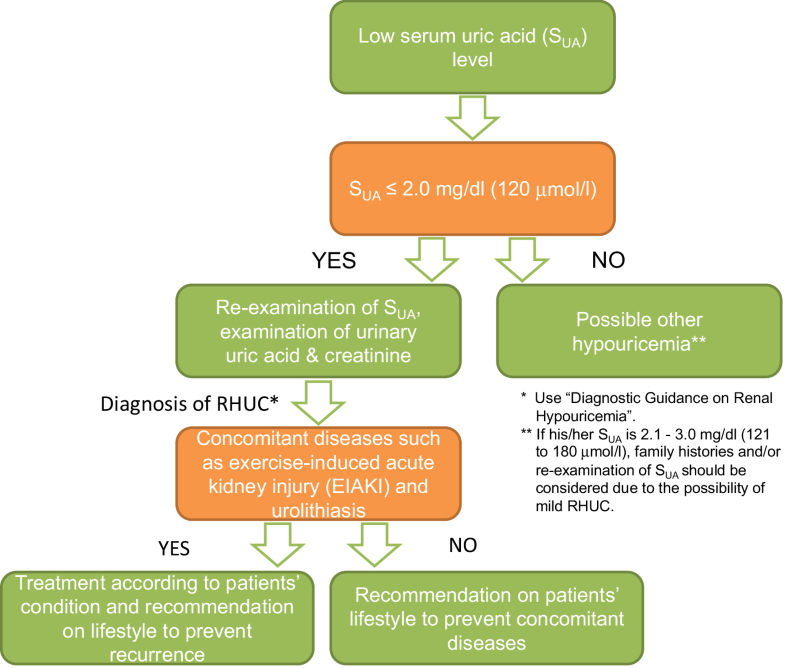 Renal hypouricemia (RHUC) is a disease caused by dysfunction of renal urate reabsorption transporters; however, diagnostic guidance and guidelines for RHUC have been lacking, partly due to the low evidence level of studies on RHUC. This review describes a world-first clinical practice guideline (CPG) and its first version in English for this condition. It was developed following the “MINDS Manual for Guideline Development” methodology, which prioritizes evidence-based medicine. It was published in Japanese in 2017 and later translated into English. The primary goal of this CPG is to clarify the criteria for diagnosing RHUC; another aim is to work towards a consensus on clinical decision-making. One of the CPG’s unique points is that it contains textbook descriptions at the expert consensus level, in addition to two clinical questions and recommendations derived from a systematic review of the literature. The guidance shown in this CPG makes it easy to diagnose RHUC from simple blood and urine tests. This CPG contains almost all of the clinical foci of RHUC: epidemiology, pathophysiology, diagnostic guidance, clinical examinations, differential diagnosis, and complications, including exercise-induced acute kidney injury and urolithiasis. A CPG summary as well as a clinical algorithm to assist healthcare providers with a quick reference and notes from an athlete for both physicians and patients are included. We hope that this CPG will help healthcare providers and patients to make clinical decisions, and that it will promote further research on RHUC. The online version of this article ( https://doi.org/10.1007/s13577-019-00239-3) contains supplementary material, which is available to authorized users. Renal hypouricemia (RHUC) is a pathological condition that is caused by faulty urate reabsorption transporters in the renal proximal tubular cells. It does not derive from congenital purine metabolism abnormalities or secondary hypouricemia. In this review, we display an overview and summary of our world-first clinical practice guideline (CPG) for RHUC (See Supplementary Material for the complete guideline). Ever since Akaoka et al. first reported a case study of RHUC in Japan in 1975, RHUC has been known to be relatively common in the Japanese population (approximately 0.3%) [2, 3]. RHUC is also reported in Jewish  and Roma  populations. Recent genetic studies have identified faults in the URAT1/SLC22A12  and GLUT9/SLC2A9  urate transporter genes as causes of RHUC type 1 and type 2 , respectively, but there are some patients who have no dysfunctional mutations in these genes, suggesting that there may be unknown causative genes. Nevertheless, healthcare providers lack awareness of RHUC, partly because there is no diagnostic guidance by expert consensus and no guidelines. This situation prompted us to develop the first ever CPG for RHUC. The primary goal of this CPG is, therefore, to clarify the criteria for diagnosing RHUC. Another goal is to work towards forming a consensus on clinical decision-making by enlightening healthcare providers. As our methodology, we adopted the Medical Information Network Distribution Service (MINDS) Manual for Guideline Development [8, 9, 10] which has been developed by the Japan Council for Quality Health Care to secure the broadest possible scientific basis. For example, three teams developed the guideline: the Guideline Supervising Committee, Guideline Developing Group (GDG), and Systematic Review Team (SRT), in addition to the Guideline Secretariat, chosen to prevent conflict of interest, as shown in the CPG. In the current edition, two clinical questions (CQs) are posed, based on key clinical issues: the diagnosis of RHUC and prevention of exercise-induced acute kidney injury (EIAKI, also known as acute renal failure with severe loin pain and patchy renal ischemia after anaerobic exercise: ALPE), which is one complication of RHUC. Before the publication of this CPG, a draft was evaluated by an external reviewer and public comments were invited. The Japanese version was published in 2017. This CPG has been translated into English and is here provided as Supplementary Material. This CPG project was supported by grants from Japan’s Ministry of Health, Labour and Welfare (fiscal year 2014–2016). There was no research on RHUC with sufficiently good evidence for CPG, such as randomized controlled trials (RCTs), but excluding all research reports on RHUC without exception due to low evidence levels would send the wrong message to clinical practitioners, and would also depart from the key aim of this guideline, which is to enlighten healthcare providers about RHUC. Therefore, “consensus levels” are added as expert opinions on each statement in the textbook description. This CPG contains almost all the clinical points relevant to RHUC: it covers epidemiology, pathophysiology, diagnostic guidance, clinical examinations, differential diagnosis, and complications. The summary of the textbook description is as follows. The prevalence of RHUC is estimated to be approximately 0.2% in males and 0.4% in females in Japan [2, 3]. 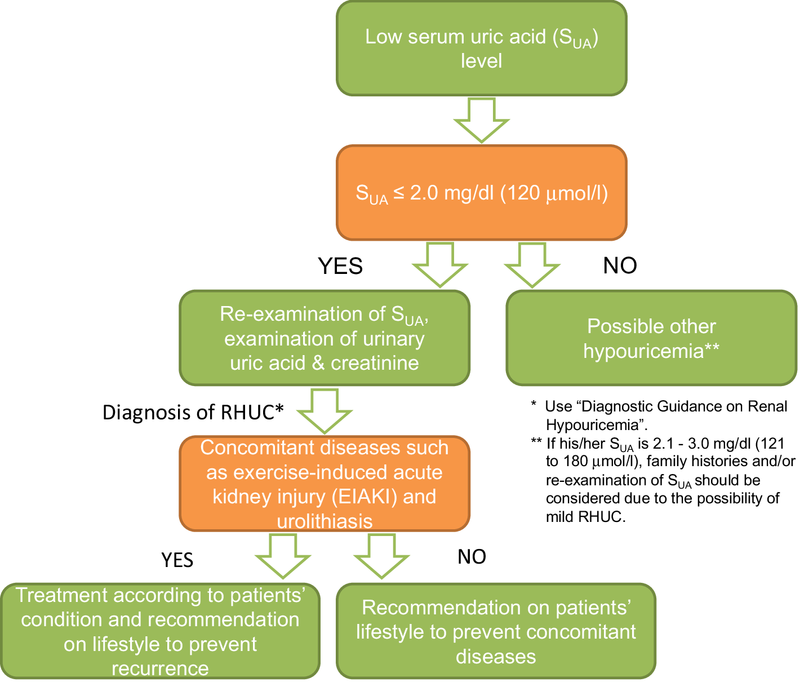 Although RHUC itself is asymptomatic, one of its characteristics is a low serum uric acid (SUA) level combined with increased renal excretion of uric acid. Figure 1 and Table 1, respectively, display the clinical algorithm and diagnostic guidance for RHUC. One notable characteristics of the diagnostic guidance is its simplicity: it enables a diagnosis of RHUC from simple blood and urine tests alone, and does not always require genetic examinations. Table 2 shows the differential diagnosis of hypouricemia. Of these, excluding drug-induced hypouricemia, the asymptomatic diseases that result in hypouricemia are only RHUC and xanthinuria. Xanthinuria is a rare disease with only a few 100 patients ever reported, and is distinguishable from other types of hypouricemia because it shows little urinary urate excretion . Most RHUC cases have been discovered by chance in health examinations that detect low SUA levels. Clinical signs of urolithiasis and EIAKI often lead to an initial diagnosis of RHUC. EIAKI cases sometimes need hemodialysis treatment, but generally show transient and recurrent acute kidney injury (AKI), and receive the standard treatment for AKI. Allopurinol, a xanthine oxidoreductase (XOR) inhibiter, was administered in some case reports [12, 13, 14] for preventive purposes, based on a hypothetic mechanism of its pathogenesis, although convincing evidence for its efficacy is lacking. For urinary stones, urinary alkalization using citrate compounds is an effective therapy , and drinking plenty of fluids is recommended for prevention. Based on the experts’ opinions of the textbook description above, two key clinical issues were raised on the diagnosis of RHUC and prevention of EIAKI using the PICO (Patient/Population/Problem, Intervention, Comparison/Control/Comparator, and Outcome) framework. The first CQ (CQ1) is “Should individuals with a serum uric acid level of ≤ 2.0 mg/dl be considered for differential diagnosis of hypouricemia?”, and the second CQ (CQ2) is “Should XOR inhibitors be administered to prevent EIAKI in patients with RHUC?” Two independent SRT members in charge of each CQ conducted a literature search and two screenings. The survey uncovered 545 papers, of which 455 were adopted after screening for CQ1; and 43 of 54 papers passed CQ2. Based on the submitted systematic review report by SRT, GDG decided on the recommendations and their strength as shown in Table 3. CQ1: Should individuals with a serum uric acid level of ≤ 2.0 mg/dl be considered for differential diagnosis of hypouricemia? Recommendation 1: It is strongly recommended that such individuals be considered for differential diagnosis of hypouricemia. CQ2: Should xanthine oxidoreductase (XOR) inhibitors be administered to prevent exercise-induced acute kidney injury (EIAKI) in patients with renal hypouricemia? Recommendation 2: It is not yet possible to make a hard-and-fast rule. However, XOR inhibitors might prevent the onset or relapse of EIAKI. Administration of XOR inhibitors should therefore be decided in the light of its potential benefits and harms, especially for athletes and high-risk patients with a past history of EIAKI attacks. For applicability of the CPG, that is, for healthcare providers’ easy reference, a Brief Summary of the CPG, including Fig. 1 and Tables 1, 2 and 3, were added to the first page. Moreover, “Notes from an athlete” for the enlightenment of both physicians and patients is provided by a patient with RHUC, a female mixed martial arts fighter struggling with EIAKI. As described above, the main purpose of publishing the CPG is to make this guideline available to healthcare providers, so that the actual prevalence of renal hypouricemia can be clarified and research on RHUC further promoted. It is hoped that this CPG will encourage the development of novel therapies as well as preventive methods for RHUC patients worldwide. 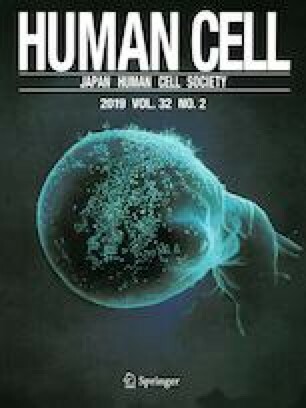 The authors would like to thank the Japanese Society of Gout and Nucleic Acid Metabolism (JSGNAM), which jointly edited this CPG, and to Ms. Mei Yamaguchi, an RHUC patient and athlete, who gave us extremely useful advice. The preparation of this CPG was supported by grants from the Ministry of Health, Labour and Welfare of Japan (fiscal year 2014–2016). The first author AN, and the corresponding author and the representative of the Guideline Development Committee Members NS declare that they have no conflicts of interest (COIs). Some of the other authors received lecture fees, research funds, scholarships or incentive donations from Teijin Pharma ltd, Sanwa Kagaku Kenkyusho Co., Ltd., Fujiyakuhin Co., Ltd, and Torii Pharmaceutical Co., Ltd. For the reported COIs shown above, the Guideline Developing Committee has devised measures to avoid the influence of their COIs regarding guideline development. See Supplementary Material for the detail of COIs and its counter measures.